Looking for the best karaoke songs for altos? Everybody loves karaoke night and singing. There’s music and dancing and quality time with friends. 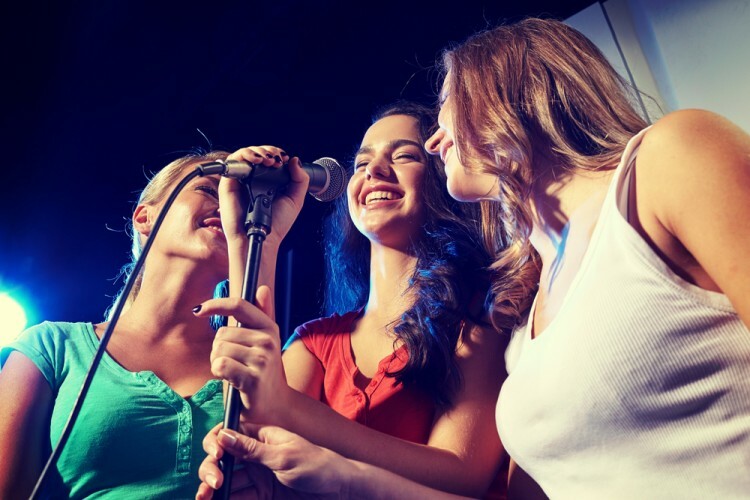 Karaoke nights can be great icebreakers for a group of strangers and can bring the party to the house when you are with your BFFs. However for some karaoke night can be quite a pressure. We are not all the best of singers and not every song sounds great sung by every voice. The song choice can make or break your performance. So, if karaoke night is around the corner, and you want to go prepared – the first most important thing is to make sure you are not singing songs that are meant for sopranos! Being an alto doesn’t mean that you can’t sing karaoke! Girls with an alto vocal ranges sometimes have the most beautiful voices with great voice textures. In fact, some of the most popular pop singers are altos like Adele, Amy Winehouse, and Sara Bareilles. With the right song, you can conquer the karaoke stage like a diva. Our list of the most fun and popular karaoke songs suited for alto voices is a great place to start your hunt at picking the perfect song. It not only spans a wide range of songs for every mood but also features some of the best alto singers of our times. The list was handpicked by going through different sources like other internet lists by Portland Music Foundation, and Nyln, insights from Quora and the Christina Noel Blog, together with picking the popular numbers from Karaoke albums for altos. So, look no further because this is the ultimate list you will need to bid your karaoke jitters goodbye! Choosing the right song might be the tricky part. And that is why we have our lists to help you out. Even the worst singers can nail the karaoke with the 11 Best Karaoke Songs For People Who Can’t Sing and altos can own the mic with the following best karaoke songs for altos. We bet you’ll be taking rounds at the karaoke machine all night long! 11 best karaoke songs for people who can’t sing 12 Best Karaoke Songs For Altos Arms of the Angel by Sarah McLachlan karaoke song Auditions Songs For Alto Singers Beautiful by Christina Aguilera karaoke track Best Alto Singers best songs for altos Best Songs For Karaoke great altos songs Is Adele a alto singer? Is Because of You by Kelly Clarkson a good sad song for karaoke Is Have a Little Faith by Jewel a good country song for karaoke Is Lady Marmalade by Various Artists a good karaoke song for altos? Is Bubbly by Colbie Caillat a good pop song for karaoke Is Love Gets Me Everytime by Shania Twain a good 90s song for karaoke Is Love Song by Sara Bareilles the best karaoke song for altos? Karaoke Songs List XFinance Most Popular Songs For Alto Singers No Scrubs by TLC as a karaoke song Popular Alto Singers popular songs for altos Rollin’ in the Deep by Adele karaoke track Slideshow Songs Best Suited For Altos Songs For Alto Singers This Kiss by Faith Hill country song for karaoke Valerie by Amy Winehouse karaoke track for altos Which is the best karaoke song for altos? 8 Best Personal Finance Apps: Opportunity or Threat For Asset Management Companies?